Medicinal Mushrooms like Reishi and Chaga have got a lot of attention in recent years for their herculean medicinal qualities. All medicinal mushrooms have huge health benefits; anti cancer properties, anti oxidants, massive mineral density, adaptogenic, immune system boosting/ modulating. In Eastern traditions these powerful anti ageing herbs would have been considered sacred. Reishi Mushroom was at one time only allowed for the Chinese elite and you could have been killed if found in possession. I’m a big fan of the Daoist herbal tradition, which focused its attention on spiritual attainment; energy cultivation and longevity. The teachings revolved around the subject of the Three Treasures; Chi, Jing and Shen. We’ve all heard of Chi in the Western World thanks to the spread of martial arts practices and Bruce Lee but lesser known are the concepts of Jing and Shen. Jing is kind of a bigger deal according to Daoist philosophy as it is seen as the battery pack, bank account or reserve of energy that is not used but creates a foundation in a sense. It creates a sense of stability, a feeling of being nourished, vital and full, ready for anything, adaptive to whatever life throws at us. With the hectic pace of the modern world we see ourselves dipping in to this reserve far too much, people are running on empty close to burn out keeping themselves going on stimulates which further the problem. Jing is inherited through our parents when we are born, healthy parents = healthy baby. We dip in to Jing through too much stress, over eating, chi leakage, over consumption of alcohol, drugs, child birth, excessive seamen distribution.Shen is deemed as having a Spiritual awareness an awareness of more than ones self, an awareness of one’s purpose, qualities of humility, humbleness, reliability and wisdom. What the Daoist sages were implementing essentially was acquiring or cultivating Jing as the basis for strong Chi and Shen. The analogy of the candle see’s Jing as the wax, Chi as the Flame and Shen as the light. So the Daoists worked with Tonic herbs that fortified the Three Treasures, often these tonifying herbs are related to the kidneys and adrenals as that is where we leak energy from when running on empty, adrenal fatigue is rife in the modern world and medicinal mushrooms are one way to give yourself the necessary juice we need to thrive in this day and age … Phew! …Now finally for some Turkey Tail. If you’ve made it thus far then well done. I felt it necessary to ramble on about the reason I first got in to medicinal mushrooms and tonic herbs and now why I’m so chuffed to have stumbled across Turkey tail, (Tremetes Versicolour), Turkey Tail is a native medicinal Mushroom to the UK and is quite prolific. One reason I’m so excited about said mushroom is because I am aware when consuming some of the foreign herbs that it may not be so environmentally sound for me to do so. I am also very much in to the idea of building yourself from the environment around you, as part of the natural eco system you would be eating the plants that were native to the area and in season. There is also the idea that the plants that you most need for your health grow close by to you, this may sound outlandish to some but when you start to see your self as a part of the natural web this then becomes clearer. Identification; I don’t pick mushrooms regularly as a food source, its an area of foraging that requires a lot of knowledge and experience. I do however feel confident in learning as I come across different varieties and become more familiar as I see them around, Turkey Tail has been one of those that I have come across a lot and this is the first year it felt right to harvest some, I’d taken photographs and took some samples home to identify and found out that there aren’t many you can confuse it with once you identify its distinguishing features. Turkey Tail grow in clusters and look like their name suggests, they range from 1cm to 4 inches are thin and flexible and have a corky flesh. Its underside has pores ( like smallraised dots or bumps) not Gills! (lines). It is quite a beautiful specimen, colours do vary but generally found to be brown with each zone a little different in colour, the top is smooth and velvety, it grows on the deadwood of hardwood trees and in clusters not singular. Remember be sensible, Mushrooms can be extremely poisonous anyone consuming mushrooms from the wild does so at their own risk, take to it slowly, buy some good identification books, do your research, go on some guided walks with experts. When in doubt throw it out. Always harvest responsibly leaving enough behind for the mushroom / plant to regenerate which ensures a healthy system and enough for other people, animals or yourself in the future. 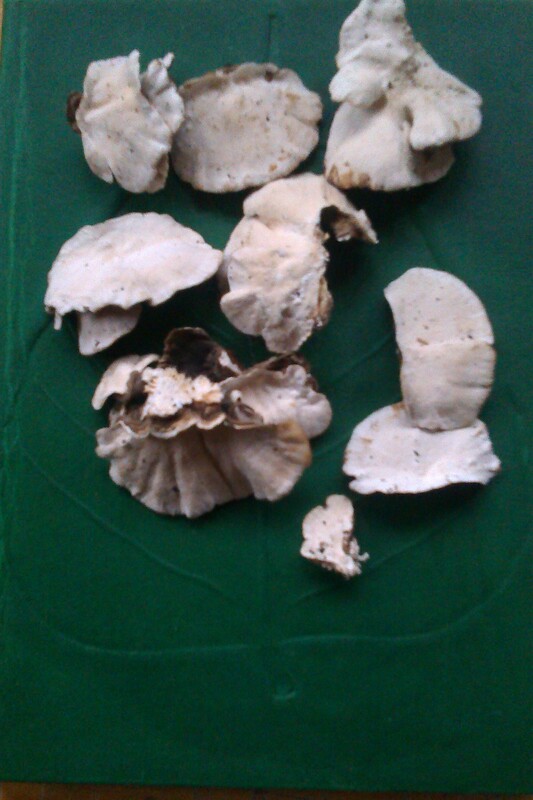 There is a great identification test you can do here, http://www.mushroomexpert.com/trametes_versicolor.html i Below; 1st pic. Drying Turkey Tail to use as Tea Decoction or Tincture. 2nd pic. 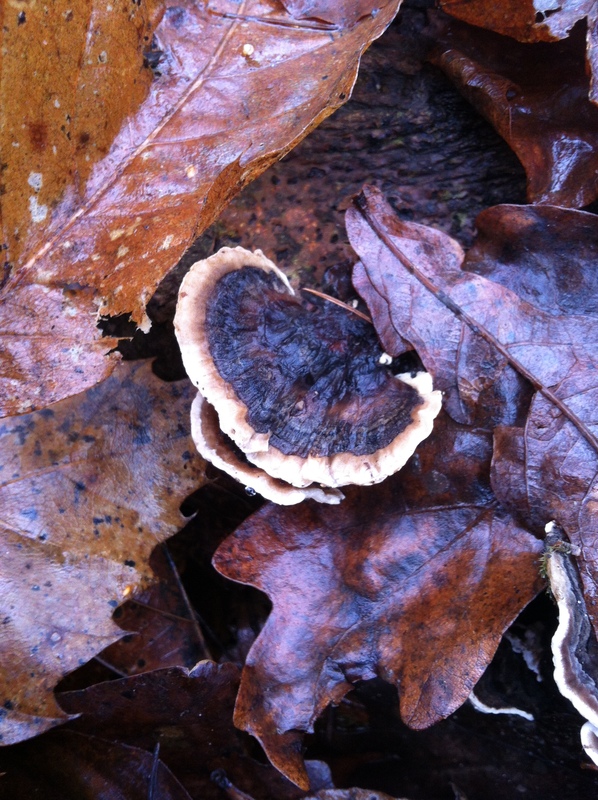 Underside of Turkey Tail. Medicinal uses: Turkey tail has been used to treat many chronic illnesses including many cancers, it has been shown to regenerate damaged bone marrow. As well as Human cancers it has been used in veterinary practice for canine cancers. It is a very strong anti oxidant, anti inflammatory, immune system stimulant and modulator, anti viral, anti fungal, pain relief with no side effects, reduces phlegm, respiratory conditions, poor digestion, Urinary conditions, liver problems and Hep B. This is an overview of the actions and uses, as with most medicinal plants, mushrooms, natural substances it never ceases to amaze me the list of healing benefits and properties that one organism has. Disclaimer: The information here is for educational purposes only and should not be used to diagnose or treat disease. Always consult a competent health practitioner of your choice when dealing with any health issues. Categories: Wild Food | Permalink.